While eyedropping in colors from the original strips to recreate these, I’m often put off by what color choices I made back then. Joyce’s skin is this kind of sickly gray, and the shade of her orange shirt isn’t too attractive, either. And purple pants? What? Of all the colors on Joyce to decide are vibrant, I choose the purple pants? Often I have to resist the urge to color correct, but adhering to the colors of the flats is the one thing I try to maintain consistency with as I recolor these things. Back then I didn’t have standard color palettes for my characters. I just picked them blindly out of the RGB grid in Photoshop or whatever every time I needed to color anything. And so over time they shifted a bit. I wouldn’t develop consistent color models for my characters until about a year into Shortpacked!. … Can’t decide on which song reference to go with. I must have read it’s Walky all the way through 3 times, and this is the first time I ever noticed the pizza boy is Danny. Wow, I can’t believe I never noticed that until you pointed it out. Maybe it’s just that it’s bigger than on the old site? I hadn’t noticed before either, but this time I was all, “Wait, is that Danny?” and scrolled down to check the tags for confirmation. …and apparently Walky in the last panel is actually Sal. I admit I always thought the same about early Joyce in colour, but I think it’s mostly her grey “blond” hair. Indeed. There is Danny’s name in the title bar. It’s strips like this that make me wonder. Will Walky ever manage to get ahead of Danny in the cloud? After all, Danny is a much larger focus of Roomies! than Walky is in It’s Walky!, and Danny gets to show up in the latter too, complete with a couple of storylines! Joyce, on the other hand, I’m expecting to easily eclipse the both of them. What about Joe? I think he appears a lot more than Danny. If you go to the cast page, you’ll see Danny is the strong leader at 389 appearances, with (as of today) Joe and Joyce tied at second with 321. Walky still has less than half as many appearances as Danny at 172. Cool, didn’t know there was a strip count on the cast page. Have learned something new! 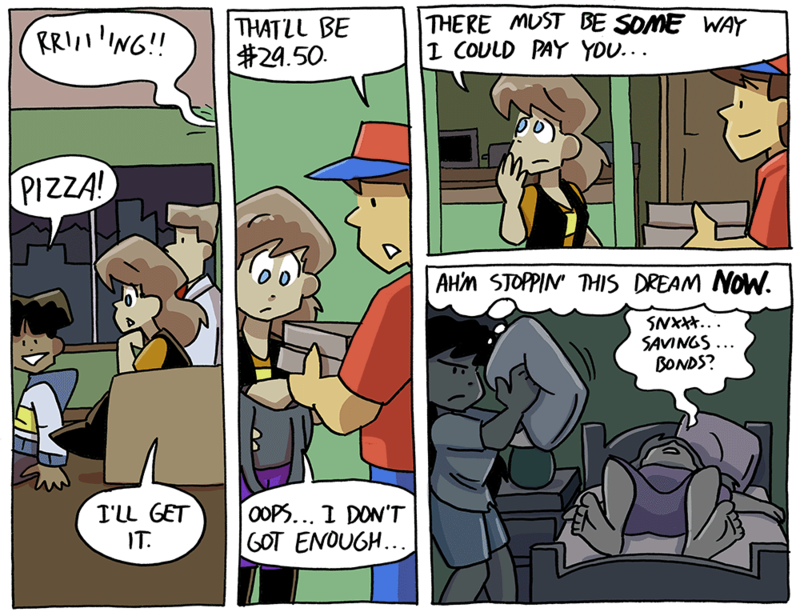 Sheesh, what does Sal have against Joyce having a nice dream once in awhile? … still the best joke in these comics. Oh Sal, if only you could apply that callous murderous attitude towards Joyce, we could have been saved from another nuisance.